The Makina 67 is a 6×7 strut folding camera with a coupled rangefinder. It was developed by Plaubel after the company was bought in 1975 by a Japanese company named Doi and released in March 1979. Kimio Doi, the first president of Doi Inc. received information on a small German camera maker with a long history, the Plaubel company in Frankfurt am Main. The company was at the time managed by Goetz Schrader (son of Hugo Schrader, the founder). Schrader had decided to sell the company, as he was becoming old of age (born in 1907). The Japanese Doi Group ended up purchasing the company in April 1975, through "Interprofia" a japanese agent of Plaubel. Shortly after, Doi ordered Plaubel to start development of a new camera, with a new lens design specially developed by Nikon. Doi always wanted to make production, sales and photo finishing as three pillars of the company, and was intending for the camera to support this strategy. Doi also prioritized the exterior camera design, and asked professor Udo M. Geissler, from the industrial design department of the Munich University of Applied Sciences, for help. The result was the Makinette 67 camera prototype. 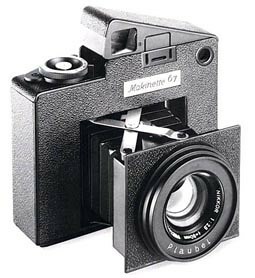 The Makina 67 was first shown as a prototype "Makinette 67" at Photokina in September 1976, quite different from the production model. The most noticeable functional difference is the patented viewfinder (US 4166682 A), which would pop up when the lens was pulled out to the infinity setting, and fold into the camera body when the lens was retracted. The purpose was to minimize the dimensions of the camera in the folded state, while providing an unobstructed viewfinder. Patents were applied for by Goetz Schrader (the previous Plaubel owner, and CEO until 1984) in September 1976, in time for the Photokina launch. This includes the scissor linkage (US 4171891 A), shutter release (US 4166686 A) and adjusting and latching mechanism (US 4146320 A). Other features later found in the production camera, include the focusing wheel on top of the camera, and the scissor linkage for the lens unit. Supposedly aperture priority AE was already available using a GPD meter, with shutter speed being displayed in LED lights on the left side in the viewfinder interior. When film loading, the entire back had to be removed. The actual image size was 56 x 67mm. The size of the prototype was annouced as 160x128x120mm (57mm depth when folded), with a weight of less than 1 kg. However, Doi was dissatisfied with the design, in particular the size and weight of the camera made it unsuitable for hand-held shooting (actual weight of the camera came to 1570 g). In addition the pop-up finder and film mechanism were not practical. In the end this concept was therefore not used. An transparent Makinette 6x7 prototype, showing the internal layout of the camera, is featured in a photograph by conceptual artist Christopher Williams (see here), who has also featured the Makina 67 in other photographs. Kimio Doi, of the Doi Group, decided to seek a limited redesign, with the basic Plaubel-design being kept. He contacted his old acquaintance Hirohiro Tomioka, president of Konishi Rokko (later Konica). The amount of manufactures who had the necessary experience was limited, however Konica was available and already had experience with OEM production. Tomioka then nominated Yasuo Uchida as lead designer (previously designer of the 1975 Konica C35 EF).. Uchida would be responsible for the mechanical design and the electric circuits. Yasuo Uchida went to Munich to consult with Geissler. The design principles were to create a camera that could 1) take good pictures and 2) be easy to use. Regarding picture quality, the "Doi International Design Department" emphasized that the lens must be excellent and that the camera should use medium format film. The 6x7 format was chosen as the ideal format for prints. Furthermore the rangefinder, exposure meter and other camera parts were designed to be highly durable, ensuring high image quality. As for ease of use, the designers emphasized compactness and light weight for convenient carrying. Priority was also put on making the camera easy to hold and operate, including making the wind lever ergonomic and the size and placement of buttons.. The new design realized by Uchida and Geissler was smaller and simpler than the Makinette 67, however only slightly (160x128x120mm (57mm folded) and 1570g for the Makinette 67 vs. 162x115x113mm (56.5mm folded) and 1280g for the Makina 67). In a 2015 interview, the chief designer, Yasuo Uchida, stated that he disagreed with Geissler on some parts of the exterior design, and had them adjusted. They also argued about the size of the lens face, which Uchida wanted to keep as small as possible, while Geissler wanted as large as possible. Geissler refused to budge, and Uchida yielded in the end. In retrospect Uchida considerds the lens face one of the Makina 67's distinguishing features, stating that the exterior design is a key factor of the camera, and regards Geissler's work as "amazing". 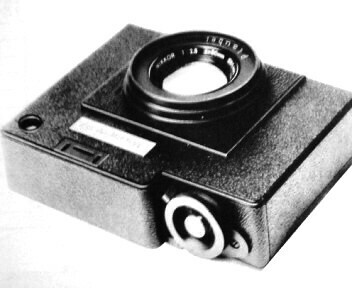 Doi furthermore wanted to make the Makina 67 an automatic exposure camera, which was a trend at the time. However Uchida refused, as he felt that it was a camera for professionals using slide film, where correct exposure is critical, and AE was not accurate enough in this regard. In the end a manual exposure meter was used. Uchida, from Konica, also requested Doi to use a Konica lens for the camera. However Kimio Doi disagreed, having already paid Nikon for the development of the 80mm f2.8 lens specially for the Makina (or rather Makinette 67 at that time), after taking over Plaubel. Uchida asked for a copy of the lens for testing, and agreed to use it after being satisfied with the results. Besides the external design, Uchida now considers the Nikkor lens a distinguishing feature of the camera. The redesigned Makina 67 was first shown at Photokina 1978, and was released in March 1979 for a price of 158 000 yen. 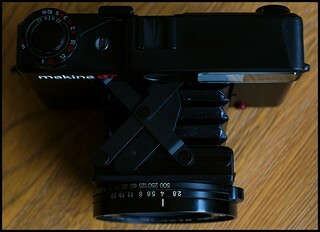 The camera's shape is reminiscent of the Makinette 6x7 prototype, but also the earlier Makina. After the redesign it also closely resembles the Agfa Optima Sensor Series (first released in 1976), designed by professor Norbert Schlagheck at the design firm Schlagheck & Schultes, a colleague of Geissler at the Munich University of Applied Sciences. The similarities with the Agfa camera was also noted in a contemporary Japanese review, pointing out the German roots of the designer, while characterizing it as a roundish, soft and elegant european design. Recently Geissler explained that Mr. Schultes at the time was not happy with the similarities with the Agfa Optima Sensor series, however there was no fall out and no legal action taken. Further Geissler stated that the cameras should be seen as reflecting “state of the art for this period of European design understanding”. 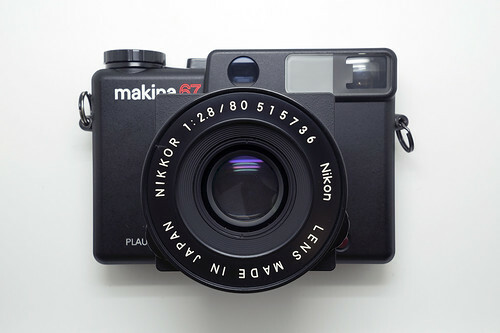 The Makina W67 followed, announced at the 1981 PMA, with a specially designed Nikkor 55/4.5 wide angle lens and some changes to the design including a ribbed body, rubber ring on the focusing dial, smaller front face and a rectangular rangefinder window instead of round. The design changes were by a design office agency of professor Geissler in Japan. The Makina W67 was released in December 1981 at a price of 198 000 yen. The new body features were later used for an update of the original camera in 1984, for 187 000 yen, called the Makina 670, which however kept the large lens face, but changed the red front face button to a "neutral" black one. 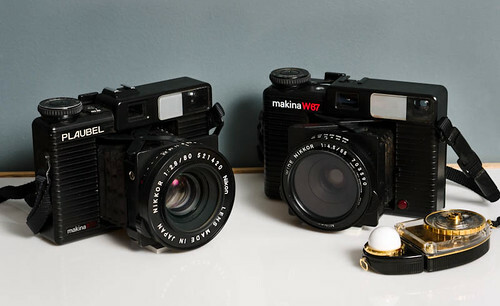 The changes to the W67 and 670 cameras arguably are to the detriment of the original design signature of the Makina 67. The production Makina 67 bodies at first made in Japan by Copal. It was said many individual adjustments were necessary for each camera at the assembly stage, due to the German made bellows, a critical part of the camera. Pinholes in the bellows caused light leakage, and meant the whole production line had to halt, while urgent re-orders were made to the bellows manufacturer. Furthermore the re-delivered bellows did not match specifications when folded, causing the production line to stop. Mamiya president Naoyo Ishida had previously suggested that production of medium format cameras should be aggregated, not made separately. Due to the bellows problem, Doi decided to move production to Mamiya. Production, including design drawings, moved from Copal in Koshigaya City, Saitama Prefecture, to Mamiya in Urawa City in June 1981. At Mamiya a new production line was made, with parts from the previous factory, and production was strenghtened. At the first day of the Nippon Camera Show of 1984 news broke that Osawa Shokai, owner company of Mamiya, was bankrupt, which caused a loss of both human and physical resources at the company. In the same year Kimio Doi decided to end camera production. Employees at the time stated that his expression at the time was unforgettable, even if declaring it to be only a pause. Mamiya was rebuilt through assistance from the Cosmo Eight Group, and in January 1986 the final shipment of new Makina cameras from Mamiya was received, with sales ending in 1987. In the end about 15 000 Makina 67 cameras were produced with Copal, with an around an addtional 2000 after the move to Mamiya, totalling 17 000 units. Approximately 3500 Makina W67 units and 4000 Makina 670 units were made by Mamiya. At the 1982 Photokina Plaubel showed a prototype of a Makina Instant camera using instant-film packs, based on the Makina 67 and 67W. It had a simpler 90mm f3.5 lens with 4 elements in 3 groups, a Copal shutter, rangefinder focusing and built in exposure meter. It seems never to have gone beyond the prototype stage. Kimio Doi somehow hoped for continued production of Makina cameras, and as late as at the 1990 Photokina presented "undertable" a mockup of a 35mm bellows camera, a joint development model with Chinon. However, after Kimio Doi fell ill, the Makina series definitely ended. ↑ 3.0 3.1 3.2 Shashin Kōgyō (Photographic Industries) Vol. 37, No. 6 (1979) pp 64-74. Lewis, Gordon, ed. The History of the Japanese Camera. Rochester, N.Y.: George Eastman House, International Museum of Photography & Film, 1991. ISBN 0-935398-17-1 (paper), 0-935398-16-3 (hard). P. 154. McKeown, James M. and Joan C. McKeown's Price Guide to Antique and Classic Cameras, 12th Edition, 2005-2006. USA, Centennial Photo Service, 2004. ISBN 0-931838-40-1 (hardcover). ISBN 0-931838-41-X (softcover). P. 789. Sugiyama, Kōichi (杉山浩一); Naoi, Hiroaki (直井浩明); Bullock, John R. The Collector's Guide to Japanese Cameras. 国産カメラ図鑑 (Kokusan kamera zukan). Tokyo: Asahi Sonorama, 1985. ISBN 4-257-03187-5. Items 1397–8 and 1400. Makina 67 (brief summary and archived bulletin-board discussions) at an archived version of Robert Monaghan's Medium Format Photography website, at the Internet Archive. Makina 67 PDF manual in multiple languages from OrphanCameras.com website. This page was last edited on 21 October 2018, at 06:58.